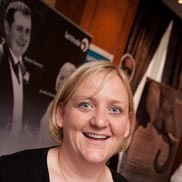 Jennifer Deeney, whose husband Kieron died in an industrial accident, responded with alarm when she read in the Independent that the Prime Minister wanted to “kill off safety culture”. So she wrote him a letter. I read this article with total dismay, she tells David Cameron. For me, the lack of understanding and the confusion between a safety culture and compensation culture is baffling. Jen is the subject of a moving Lattitude film where she talks about her husband’s death and the effect it had on his colleagues and his family. So we wanted to support her efforts in pointing out that Mr Cameron has got things wrong. The full text of Jen’s letter to David Cameron is shown below. You may consider letting people know about it. David Cameron gets a lot of publicity when he speaks. Other voices have more difficulty being heard. So if you agree with Jen, consider what you can do to explain the good that a safety culture does. You may even want to write your own letter to the Prime Minister. To David Cameron, 10 Downing Street, London. My name is Jennifer Deeney and I am 37 years old. I work in East London as a Matron of a busy Neonatal Unit within the NHS. On the 8th of May this year I will have been married 8 years. However, I have never celebrated a wedding anniversary, a Christmas or a birthday with my husband. I have not had the chance to have children. My husband Kieron was a construction worker, a steel fixer, the best in London if he was writing this! He helped build an airport, schools, banks, hospitals and hotels all the things that are needed to keep a country living and developing. He didn’t go to Oxford, Cambridge or Eton. He didn’t go to University, he wasn’t afforded that privilege. But he loved his job and was proud of what he did and what he had managed to achieve. Thirteen weeks and two days after we married, with plans to have a family, move back to Ireland and just the excitement of things to come, Kieron was killed in an accident at work. He fell over 30 feet and died in a lift shaft in Canary Wharf. He was 25 years old. I cannot begin to explain the utter devastation. Part of me died that day too. Hope and dreams were gone replaced with grief and solitude. And why… because someone took a shortcut, someone didn’t follow process because nobody thought about health and safety, it wasn’t their responsibility. I didn’t want Kieron to become another one of the 50-70 people who are killed in construction every year get forgotten. So I have chosen to stand up and make a difference. I am not doing this because I am angry and want retribution. I am not doing this because I want the limelight. I am doing this because somebody needs to care and somebody need to say enough is enough and show that you can change things and change them for the better. I am doing this because it may save a life. I read this article with a tear in my eye and with total dismay. For me the lack of understanding and the confusion between a safety culture and compensation culture is baffling. Safety culture is about teaching and empowering workers in all industries and services to look out for each other, to follow the processes that are there to protect them. For them to understand that they have the support of the executive management team and that they want everybody to go home safe. The “albatross“ is not that of the safety culture but the picture and memory of a man lying in a lift shaft dying because process wasn’t followed, because the short cut was taken or maybe something was just more important. That “albatross” never leaves. Risk is everywhere, just walking out the front door is a risk, but I ask you Mr. Cameron to tell me of one accident that was not unavoidable? Rules and regulations are there to protect us, keep us safe and if we choose to ignore them we must accept the consequence. If as you say health and safety is “common sense”, and I agree, then why do we need to protect companies from it? Surely, this should be the minimum we should expect? From personal experience both on a personal level and as a Health and Safety Inspector with the HSE, I believe they do a great job. I think their skills are under utilised and this is because Government do not understand the hows and wherefores and have turned a service that should be proactive into a reactive service. Again, I challenge you to show me a company that has done everything “reasonably practicable” that has been punished. I choose to stand up in front of industry and say you can change things. I choose to challenge. I choose to care. I choose to stop a child cry for his/her father, a mother cry for her son or a wife cry for her husband not because it’s the easy thing to do but because it’s the right thing to do. Because our Country, our Government our Queen tell us we have the right to family life and that is what we must cherish and protect. In your words “Building our economy up to strength requires real pioneering, risk-taking spirit” and our construction industry has shown us the way. For the first time in history we have built an Olympics that has not taken a man’s life that has come in on budget and on time, something that we can stand up and say we are proud of. Is this not the way forward? Have we not just set the gold standard? I’m proud of the industries that have embraced safety. I’m proud that they have taken their responsibilities above and beyond what is expected. I rest easy knowing that there will be one less Kieron somewhere. But, I’m disappointed that you don’t understand why it’s important. I’m disappointed that you don’t understand the power of your words. Nine months before Kieron died we attended the funeral of one of his colleagues, Kieron turned to me and promised that it would never happen to him, I suppose you think, Mr. Cameron, it will never happen to you. 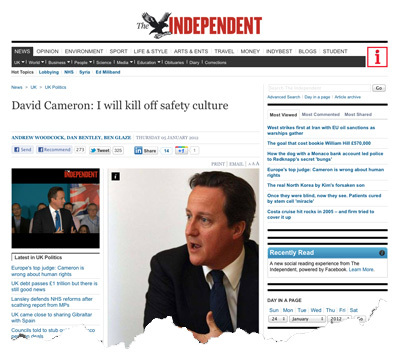 Health and safety is not the “monster” Mr Cameron it is the thing that ensures you go home safe and sound each night to your family. It protects you, it protects your family it makes sure you get to say goodbye, goodnight and I love you. The “monster” took away my goodnights, my goodbyes, my I love yous and my dreams. 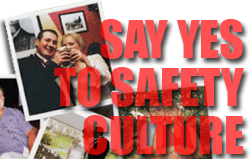 Our government’s job is to protect its people; “killing our safety culture” will kill our people. I would kindly ask that you consider this letter and I would appreciate your reply.